My grandma was a flapper (in Chicago). Hard to imagine Grandma as a flapper. She was always just… Grandma. The Flappers didn’t disappear, they just went dormant. Why does that era sound so romantic? Flappers, hip flasks, boxing, and Hemingway (oops, that’s Paris). Where did I put that goddamn time machine, anyway? I love that word flapper! Being from the Middle East I doubt we had any back there and then. 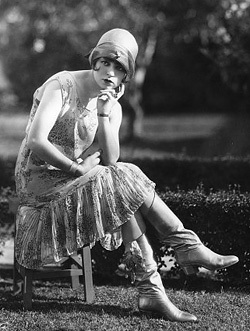 I love everything about flappers – sounds like it would have been fun to have known a few. Thanks for a great blog as well. I’ve lived here in San Francisco for the last 16 years and once when I was a very young kid with the folks and I love it here and learning about the history which I’m very passionate about is very important. It seems you’ve got a lot of history written about San Francisco here that I have to get caught up on. I love the first photo of your article. I have just started reading some books about San Francisco in the 20s. It is pretty interesting because it was really a turbulont period for all the cities in the US. I noticed in your article that, at least, a mild interest in prohibition and “gangster stuff” sparked your interest in the flapper era.I’m interested in the time period for a somewhat similar reason. I’m searching for my paternal grandfather who ran a speakeasy–a cigar store–in north beach in the early 1920s. He was mysteriously killed in an automobile accident sometime between 1922 and 1924. I think. My paternal grandmother, who remarried, spoke very little about him, and my father never knew the details of his life. definitely an interesting era. My grandmother, Florence Garvin (maiden name King), was a flapper in San Francisco in the Roaring 20s. I’m wondering if there is anywhere I can look to try to find a photograph of her and her sisters performing or posing in flapper costumes? Thanks for any help, and I enjoy your very informative blog. I love all these blogs, thank you so much! !